Emaze continues to add more templates and it releasing new types of interactive templates. Mini site– want to create mini site without hosting or coding ? you’ve got that ! this type of template look like a site- menu at the top of the presentation, scrolling from top to the bottom, call to action buttons and footer. E-card– Emaze allow you to create an E-card for any purpose like holidays, wedding, birthday and more. Sending card with a letter is so 1990. Take advantage of these templates and start sending E-cards to people you love ! Game– These templates allow you to create games like quiz, games with sounds and much more. Visual story– rather you want to tell you own story, your company or any story, this template is for you ! with this templates you can tell any story you want in a visual way. Want to start ? Start with this article ! 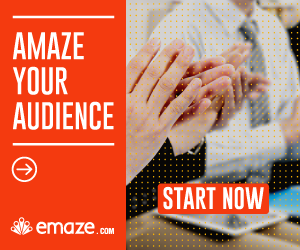 Emaze premium account (30% off Emaze COUPON) – Do you really need Emaze pro ?